Burke and Wills had set out from Melbourne on 20 August 1860, with a group of 19 men, to travel across Australia to the Gulf of Carpentaria. Their aim was to find out more about Australia’s uncharted interior. However by 1861, with no contact received from the explorers, it was obvious that something had gone terribly wrong with the expedition. In June 1861 the exploration committee organised a relief party led by Alfred William Howitt, which left Melbourne on June 26. This was one of several relief expeditions that set out to search for Burke and Wills. At Loddon River Howitt ran into William Brahe, one of the members of the expedition, who had been left in charge of the camp when Burke and Wills, short on supplies and accompanied by John King and Charles Gray, set off on a dash from Cooper’s Creek to the Gulf of Carpentaria. When Brahe told them that he did not know the whereabouts of Burke and Wills, Howitt decided that a much larger rescue party would be required. On September 15 Howitt reached Cooper’s Creek, where he found John King, the last survivor of the Burke and Wills expedition. King had survived thanks to help of local Yandruwandha Aborigines, who offered him food and shelter. It was not long later that Howitt found the remains of Burke and Wills, and buried them at Cooper’s Creek (now called Cooper Creek). The pair had died from malnutrition after they missed Brahe’s waiting relief party by only hours, then set off in a final desperate attempt to reach the settlements of South Australia. 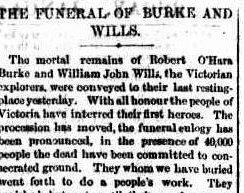 In Melbourne it was decided that Burke and Wills should be reburied with full honours, and Howitt was sent to retrieve their remains. In January 1863 the remains lay in state in the hall of the Royal Society of Victoria for two weeks, where they were viewed by more than 100,000 people. The funeral was held on 21 January 1863, and was Australia’s first state funeral. It was reported that the procession lasted for four city blocks and that 40,000 people attended, the largest crowd ever seen in Melbourne. The Argus newspaper declared that ‘with all honour the people of Victoria have interred their first heroes’. 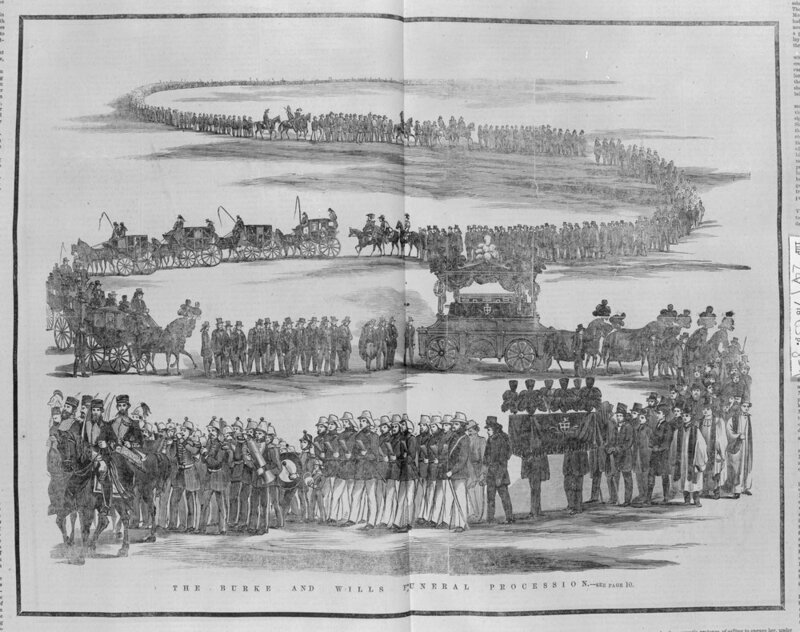 You can read a full report of the funeral procession, published 22 January 1863, in the Argus newspaper online. Burke and Wills were buried in the Melbourne General Cemetery. a guide to Burke and Wills documents held in libraries and museums across the world.